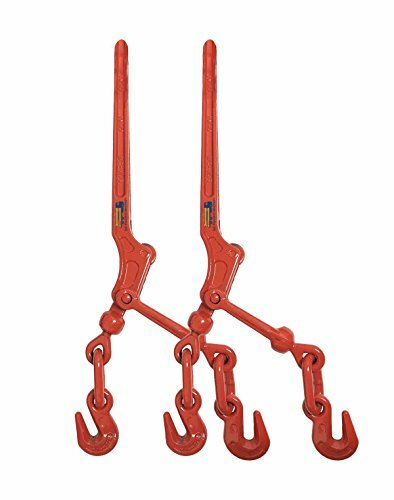 2-HEAVY DUTY - This 2-pack of Ratchet Style Load Binders has a forged steel handle that offers maximum leverage and has a working load limit of 2,600 lbs. Use it to tighten tie down chains in no time. EASY TO USE AND SAFE - Since our extremely durable ratchet load binders meet FMCSA and DOT specifications, there is no need to worry when using this binder. Also, all of the binders are conveniently stamped with the size, break strength, and working limit on the handle. 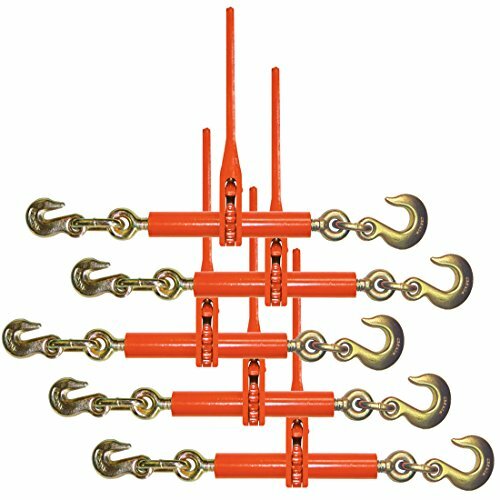 COMPATIBLE - These load binders are designed to work with a 1/4 to 5/16 chain, making it one one of the most flexible and compatible ratchet load binders on the market. DIMENSIONS - The length of this ultra strong ratchet load binder 12 inches hook to hook when closed. The total ratchet handle length is 7.5 inches. Save $$$ when you buy in bulk! We discount our bulk packages. Buy more, save more. 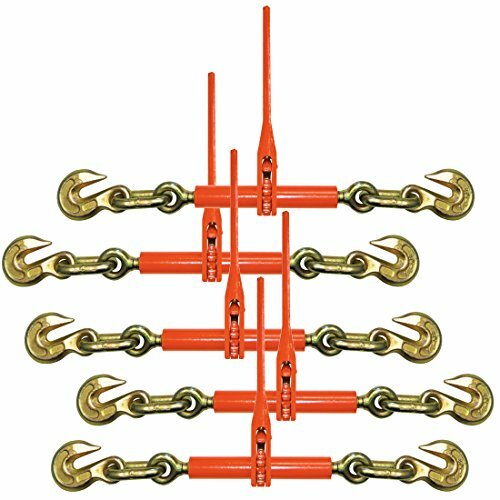 This 3/8" Transport Package includes (4) 10' Transport Chains with Hooks (4) Ratchet Binders. Eligible for FREE shipping within the 48 states. Hawaii and Alaska are available. Please contact us for more details. 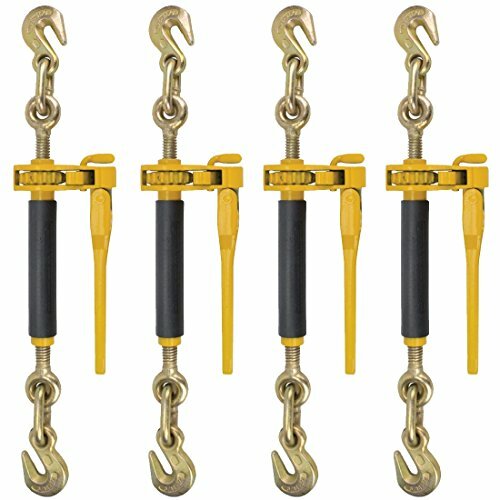 Technical Specifications Item: (4) 10' Transport Chains with Hooks (4) Ratchet Binders. Type: Transport Grade: 70 Size: 3/8" Length: (2) 10' Material: Alloy Steel Working Load Limit: Binders - 9,200 lbs / Chain - 6,600 lbs Replacement Part: Available NOT FOR OVERHEAD LIFTING Standards: ASME B30.9 Standard OSHA 29 CFR 1910.184 Ratchet Binders are dual size support for 3/8" Grade 70 and 1/2" Grade 43 Chain is 3/8" Grade 70. Ships in 2 different packages. Two Pack of Ratchet Style Load Binders. Color may Vary. 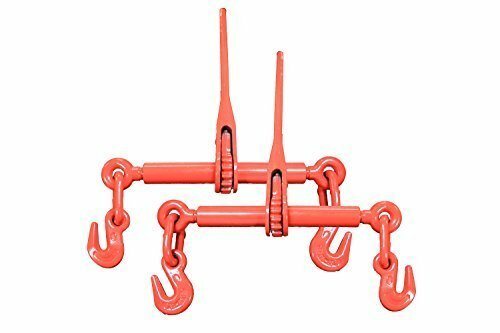 HEAVY DUTY - This 2-pack of Ratchet Style Load Binders has a forged steel handle that offers maximum leverage and has a working load limit of 5,400 lbs. Use it to tighten tie down chains in no time. COMPATIBLE - These load binders are designed to work with a 5/16 to 3/8 chain, making it one one of the most flexible and compatible ratchet load binders on the market. 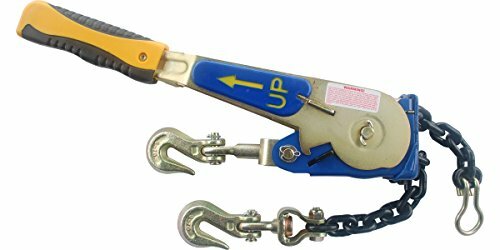 DIMENSIONS - The length of this ultra strong ratchet load binder 24 inches hook to hook. The total ratchet handle length is 15.5 inches. 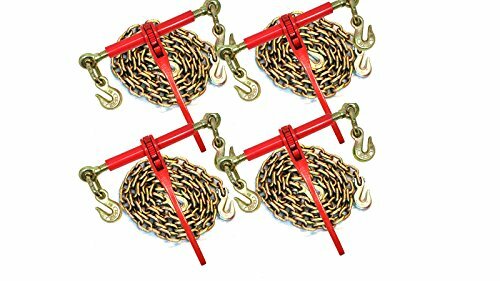 5 Grade 70 Transport Chains 3/8"
Save $$$ when you buy in bulk! We discount our bulk packages. Buy more, save more! This 5/16" Grade 70 (Also considered 3/8 in Grade 43) Transport Package includes (4) Ratchet Binders. Eligible for FREE shipping within the 48 states. Hawaii and Alaska are available. Please contact us for more details. 1/4" - 5/16" Ratchet Type Chain Load Binder. Constructed of drop-forged, heat-treated carbon steel for strength and durability. Handle length approximately at 7. Ends adjust out about 3 on each side giving you 6 of width. Quick ratcheting action ensures easy binding of your load. Ratchet Style Binders For Extra Leverage - Just extend the draw bolts, hook into your chain and tension by hand - Ratcheting motion provides maximum tension with minimal effort - Features plated draw bolts and a high visibility industrial-grade finish - Grab hook on each side - Always match binder to the grade and size chain you are using - Can accommodate up to 3/8" G70 or 1/2" G43 chain with a 9,200 lbs. Safe Working Load - Meets all CVSA and DOT requirements - Convenient pack of 5 load binders. SAFE AND COMPLIANT - The safe working load of 9,200 lbs. is clearly marked on the handle of each binder. All Vulcan towing products meet or exceed all CVSA and DOT specifications, and comply with NACM recommendations. You will be compliant for any roadside inspection, and you can work with confidence using Vulcan products - a name you can trust. Save $$$ when you buy in bulk! We discount our bulk packages. Buy more, save more! This 3/8" Grade 70 (Also considered 1/2 in Grade 43) Transport Package includes (4) Ratchet Binders. Eligible for FREE shipping within the 48 states. Hawaii and Alaska are available. Please contact us for more details. Two Pack of Snap Style Load Binders. Color may Vary. Heavy duty load binder utilizes a snapping action to tighten tie down chains. The forged steel handle offers maximum leverage, while the cam and pawl design allows for easier and faster securement. All of our chain binders meet FMCSA and DOT specifications, and are stamped with the size, break strength, and working load limit on the handle. 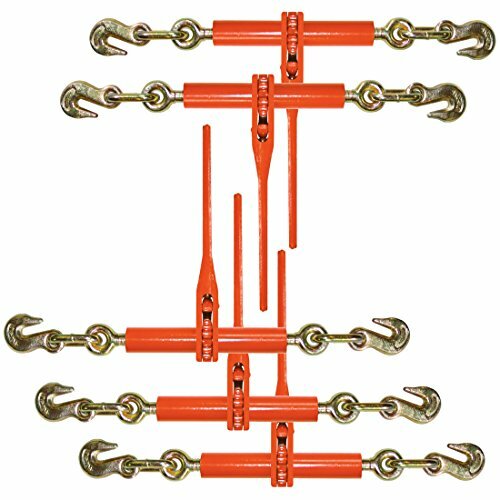 5/16" snap binders are made to be used with 5/16" Grade 70 Transport Chain. 2-PACK - Includes two snap style load binders. HANDLE - Total snap handle length: 15.5 inches. COMPATIBILITY - Designed to work with 5/16 to 3/8 chain. 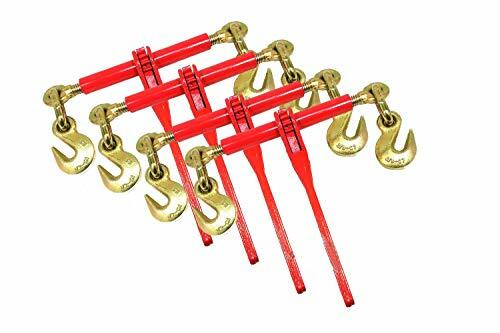 1/4" - 5/16" Lever Chain Load Binder with Grab Hooks. WLL 2600LBS, MBS 7800LBS. Lever chain binder for load securement. Gives a better control of binding and releasing of chain. Constructed of drop-forged, heat-treated carbon steel for strength and durability. Overall dimensions: side to side 9.5", front to back 11.5", overall product weight 3.8lbs. 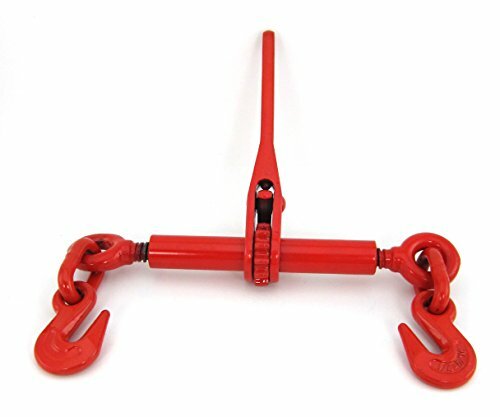 1/4" - 5/16" Lever Chain Load Binder with Grab Hooks. Lever chain binder for load securement. Gives a better control of binding and releasing of chain. Ratchet Style Binders For Extra Leverage - Just extend the draw bolts, hook into your chain and tension by hand - Ratcheting motion provides maximum tension with minimal effort - Features plated draw bolts and a high visibility industrial-grade finish with grab hooks on each end - Always match binder to the grade and size chain you are using - Can accommodate up to 3/8" G70 with a 6,600 lbs. Safe Working Load - Meets all CVSA and DOT requirements - Convenient pack of 5 load binders. 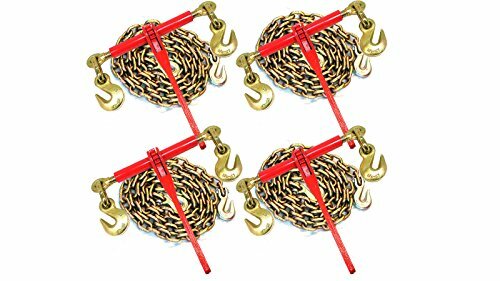 4 each G70 Commercial Truck Tie down Chains and 4 each G70 Lever Chain Binders. 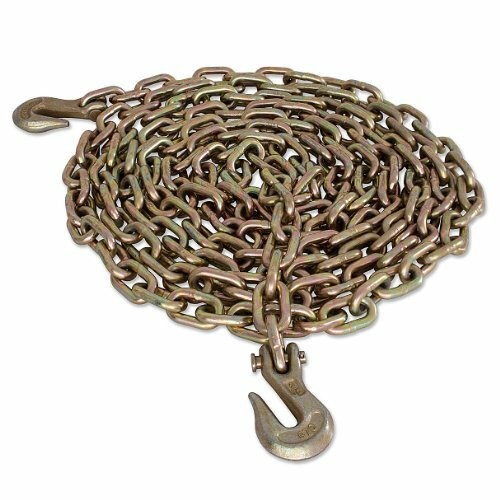 Chain is Grade 70/System 7 5/16" x 20' Long with Grade 70 Clevis Grab hook on both ends. System 7 Grade 70 chain was designed for cargo securement, binding, towing and construction use. Also called Transport Chain, it averages a 20% higher load rating than High Test chain (S-4, Grade 43). Induction heat treated, the chain meets all requirements set forth by the DOT / CVSA / CHP for truck tie-down use. Yellow zinc finish is standard on chain. These chains have a Working Load Limit of 4,700 lbs with a design factor of 4:1. Minimum breaking strength is 18,800 lbs. 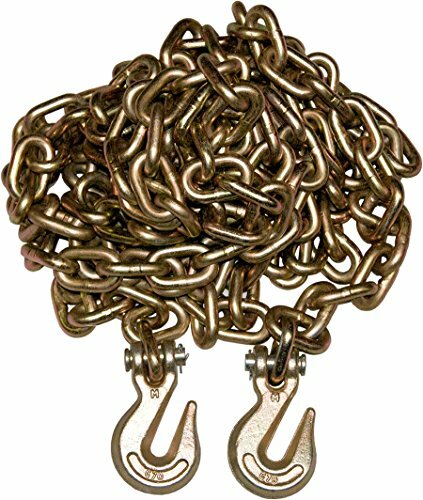 Lever Chain binders are the double swivel design for use with Grade 70 5/16" or 3/8" chain. Binders are heat treated and proof tested with forged heat treated clevis hooks. Color of binders shipped may vary depending on current stock. Binders have a working load limit of 6,600 lbs. WARNING: Do not exceed WLL (working load limit) for any chain, chain binder, tie down or cargo control device. Not approved for overhead lifting. 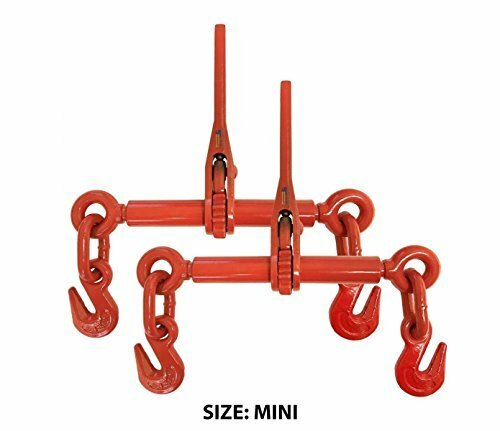 Adjustable Range(as Take Up Length on Traditional Load Binder): 1 ft.
Grade 70/System 7 3/8" x 20' Long with Grade 70 Clevis Grab hook on both ends. 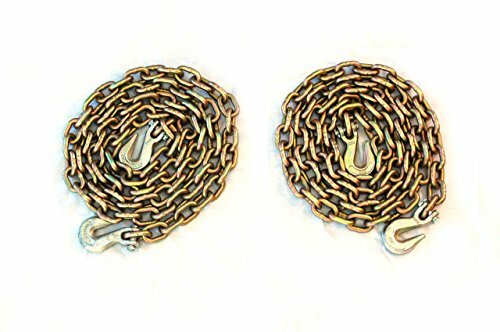 Standard link chain. 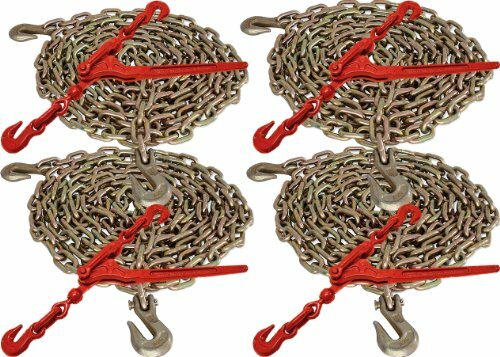 This chain has the industry standard links that fatigue less, last longer and provide more hooking points for your binders and hooks. These are the D.O.T. standard for all major transportation fleets in the United States and Canada. **Compare all chain before you buy, there is a difference and your loads safety depends on it! System 7 Grade 70 chain was designed for cargo securement, binding, towing and construction use. Also called Transport Chain, it averages a 20% higher load rating than High Test chain (S-4). Induction heat treated, the chain meets all requirements set forth by the DOT / CVSA / CHP for truck tie-down use. Yellow zinc finish is standard on chain. These chains have a Working Load Limit of 6,600 lbs with a design factor of 4:1. Minimum breaking strength is 26,400 lbs. WARNING: Do not exceed WLL (working load limit) for any chain, tiedown or cargo control device. Not approved for overhead lifting. New Federal and State D.O.T. rules effective January 1, 2004 require motor carriers to change the way they use cargo securement devices. Please check with your States D.O.T. office in regard to these changes. This lot of 1 chain will be shipped from our Just Harris zip code of 97002 to your confirmed mailing address.